I literally hate new cars. If I could make every post on this site about why they are a poor financial investment, I totally would. Unfortunately, most young people really don’t like to hear that they shouldn’t buy them. I've found that my car opinions hit too close to home, so in an attempt to keep readers I try to spread out my anti-car posts over the year. The biggest problem is that young people buy new cars because of ridiculous car advertising. If you asked someone if their new car truly “made them feel alive” or “saved” them money, the answer after the first few weeks of ownership is probably no. I would imagine that instead, they dread the payment reminder that comes in the mail once a month. You can’t fall for this advertising stuff. I mean seriously. You just can’t. Some car advertising is so blatantly twisted from a logical and financial standpoint that I’m surprised ANYONE buys into it. If you recently financed a new vehicle that you couldn't write a check for…you've been had. Simple as that. Sorry homie. Car advertisements hit emotional hot-buttons, and do it often. In 2012, U.S. car advertising spending was estimated at $15 BILLION FREAKING DOLLARS. (statista.com) That’s larger than Jamaica’s total gross domestic product for anyone keeping track at home. Because financing a car is obviously the equivalent to free college. Because that's where you rule the world from…your freaking car. I'll have to keep a lookout for cars in Game of Thrones from now on. Hey let's trade – I'll give you $500 and you give me $40,000. Deal? This one might actually be true. Tests sucked in college. It does pay…right from your bank account to theirs. 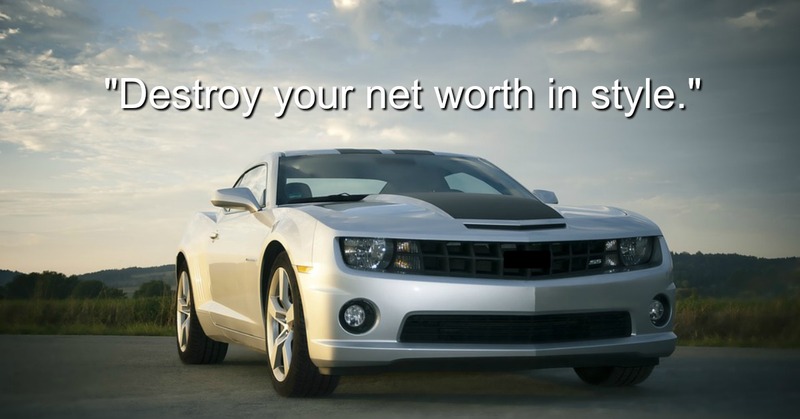 Move up in life by reaching a negative net worth! I mean, tacos are important. This is a serious quote from a car company trying to help you buy more tacos. Can't make this stuff up. *You have to pay for it with interest or we'll take it back sucker. If you learned anything from studying money in college, it's that you should finance a heavily depreciating asset to save money. Duh. Hey mommy and daddy, I'm broke and just borrowed $35,000 for something that's not worth $35,000 anymore. Aren't you proud of my new college brain power?!? If you have fallen for these, there's still time to turn it around. Pay off the car and keep it until it falls apart. If you haven't fallen for these but are going to soon, you can read more about Darwinism here. 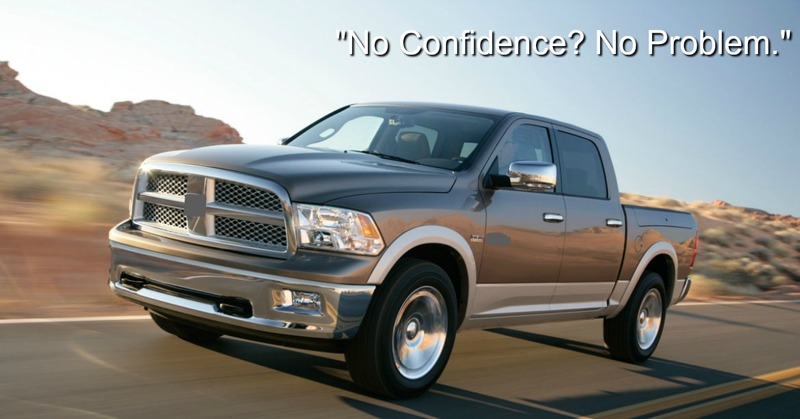 Have you ever seen terrible car slogans or advertisements before? Hi M$M, good post. Some of those slogans are astonishing, can’t believe they’re real! I tend to agree with you that you should have the cash on hand to buy a car and then decide how exactly it makes sense to finance it (with cash or a loan). I even included it as part of my recent “million dollar club” pledge posted on my blog (sorry for the plug). Lesson of the day: don’t be a sucker for marketing! Haha all good! I hate seeing young people buy new cars when there are great used ones out there for a fraction of the price! I drive a $6,000 car and people wonder why I am financially ahead of my peers. “It pays to study! $500 bonus cash for college grads” is probably my favorite. When I graduated college, I got LOADS of ads in the mail telling me the “awesome deals” I could get as a college grad. It’s funny because I’m the one that repeatedly has to convince my parents that buying new cars isn’t a financially sound thing to do. They’re the ones that always convince me to “just buy new”. They also think once a car hits 100,000, it’s time to start looking for another. Another thing you hit on in a previous post, haha. Dude I’m just going to keep hitting car posts until I get tired of it. It’s such a horrific financial decision for millennials. Shame on those silver tongued big brands that prey on the weak-minded, and naive. I bet a lot of millennials can’t shake the nightmare of car ownership. First off I cannot believe these are real slogans. Secondly, I cannot believe people fall for these slogans. Third, this was a great laugh and I love your commentary on each! Ha glad I could give you a laugh! I agree – #2 was pretty out there! If I were to dissect their income stream then #1 would be from finance charges on poor people. Makes me sick. Can’t even enjoy bacon. I feel hangry! Hey I was just checking out your site today! Yeah it’s sad what these companies come up with to bring customers in. I love $1 tacos SO much! I have no idea how a new car gets me those amazing tacos. 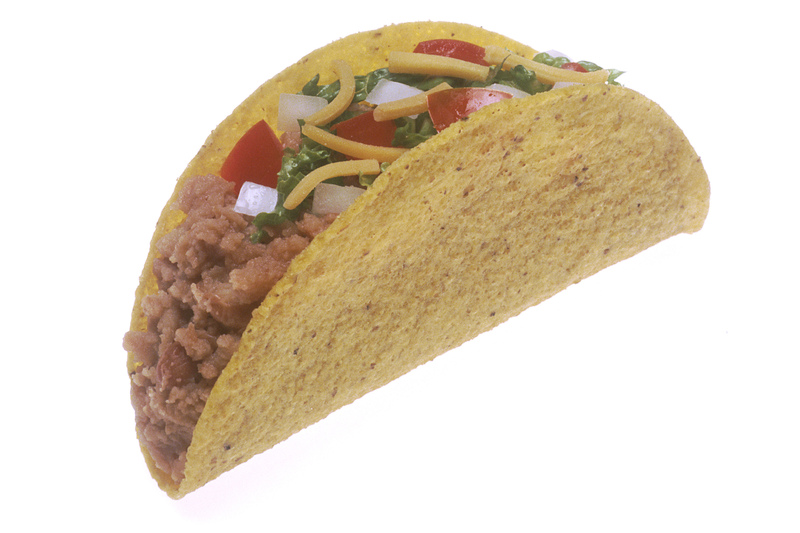 I am rather certian my very used car had helped me afford a lifetime of tacos. One of the many reasons I love that car. More taco money. I drive a $6,000 car. Tacos are abundant. Ironic that you chose one of the few new cars (ford focus RS) that probably will retain it’s value extremely well for your article cover photo. Limited production run with a niche fanboy consumer base means it likely will be worth 75%+ of the purchase price in 5 years if well taken care of. If you look at the early model Subaru WRX STIs or Nissan GTRs they sold for 75%+ of their value after 5 years. The interest and/or opportunity cost is still killer but could have picked a better car to make your point! Hahahaha I’ll be sure to keep that in mind for my next car post. Thanks! These are all hilariously sad! #8 stood out most to me because when I went to finance my car after college, my salesman kept trying to sell me this student program with lower interest so I could finance a more expensive car but I stuck to my original choice and have since paid it off. Now I just plan to drive my car until the wheels literally fall off. Salesman are probably nice people, but dang they will drop someone into more debt without even thinking twice! Glad you paid that thing off!!!!! Are those actual real life slogans?! Wow. That’s terrible!! Out of interest, in the US do people get company cars ever? I never see anyone mentioning it….I’m in the UK. They do, although honestly I haven’t seen that as much as I did when I was younger. Some people get car allowances now! Advertising for the BMW 3 Series cars: Beyond rational. Hehe, my favorite is probably the “Save like a Finance major” one because, on its face, it doesn’t make sense. You aren’t taught to *save money* when majoring in Finance. You’re taught to track money, ironically, and I would hope that Finance majors, of anybody graduating from college, would be wise enough to recognize whether the purchase of a brand new depreciating asset is really in their best interest. I should have probably put that one first! That one was definitely one of the most bizarre from a logical standpoint. I think #8 was going around when I graduated in ’08. Speaking of cars, this reminds me of the gas station advertisement now that a local one next to me has the tv screens & they offer a limited time offer that you must press the tv button for while pumping to get the coupon that can be redeemed inside with a small purchase. Haha dang that is multi-tiered marketing! The “cash back” stuff for cars makes no sense to me. Great post. Scary how we do not connect debt and having a new car. The sad thing though is that if people look at payments, a new lease car in the short term can be just as affordable as a second hand car, which can lead to an expensive balloon payment or having nothing to show for it after 3 years of payments. The second hand market is still quite expensive. However buying a car is another matter. Having said that, there are so many students driving around in high end cars that have no right being in one. Before I get nailed for this comment, the point being, firstly if bank of dad paid for it, they have lost sight of reality when the gravy train pulls into the station. Secondly, what car do they progress to later on? If they are used to high end cars and they have to pay for it, there could well be financial ruin in years to come when they have to pay for their car (expensive tastes) and other expenses. My favorite response and one that underpins society is a comment made by Steve “You aren’t taught to *save money* when majoring in Finance. You’re taught to track money, ironically. This is one issue that we are trying to rectify with teens and older on our site, where our game focuses on money habits and making decisions that allow players to consider their needs and wants which ultimately leads to learning to save and have money at the end of the month. I did read a blog post one time that mentioned a student and how she was complaining about her debts and that life was unfair. At first I had empathy as I had been a student, but when she mentioned that the first thing she did when she became a student was take out a student loan and spend $20,000 on a car I ended up thinking that ignorance is bliss and she deserves to struggle. I doubt you’ll get nailed for anti-car comments on this site! I’ve kinda found that most of my readers don’t necessarily like new cars even if they bought one. Just a few here and there that think it’s a good idea. I’m just gonna say bicycles are AMAZING vehicles. I’m 33 already have $1M plus in the networth column and I own 5 sweet bicycles. Hi, I’ve been lurking for awhile but had to comment on this post. This was great. I think you should do a blog just about the insanity of broke people financing new cars. I absolutely hate car payments and there is no car that I want badly enough to finance. BTW, I’m not a Millennial… I’m Gen X, I make a nice income in the finance industry and I’m debt free. I recently decided that it was time to let my 17 year old Toyota Camry go. It had served me well for 202,000 miles and I was very attached to it, as we had spent many years together and it had never caused me a bit of trouble. But I figured after working so hard for a couple of decades, I deserved something a little nicer. So I sold my Toyota on Craigslist for $900 and bought myself a 2006 MINI Cooper S convertible (also from Craigslist) for $6,500 cash. It has 80k miles and looks almost brand new. My mechanic said it’s in great shape and I should get many good years out of it. I love love love my new (to me) little ride. I’ve always wanted a convertible. And it’s paid for! So when I see my coworkers drive in to the office in their leased and financed shiny new cars, I just smile to myself… ’cause I know they are making big old payments each month while my hard earned money stays with me. I want to yell from the rooftop to everyone to stop being suckers! Yes, it takes discipline and patience to save up the cash and a bit of time to research good used vehicles and sometimes quite a bit of time to go look at a bunch of them, but if you put in the effort, you can find an awesome car. Someone has to break through the car insanity that has taken over. There was a Lexus ad that was so blatant it was hilarious. It had a blue Lexus sports car. Everyone was perfectly dressed and beautiful. It was something like “elicit lust, create desire, inspire envy.” I was like, thanks for being direct instead of hiding your blatant attempts at manipulating me marketers. Ha yeah I guess at least that is to the point right? Totally agree with this. I financed a car about seven years ago. The past three years without a payment have been wonderfully stress free. I’ll never finance a car ever again. Cash is king! YES! My car cost $6,000 cash and I love it! Leather seats, comfy, can haul stuff with it. I’d have to be making some big money to ever consider a new car. There’s a car dealership around here with radio advertisements offering special leasing prices for new graduates and, wait for it… free concert tickets. Advertising is such a fascinating industry. I know that I fall prey, too, but this crap is so blatant. I love anti-car posts. I chose my city based on public transportation. Saves so much. One of the worst radio slogans for a car dealer I ever heard was, “All you need is $299, and a heartbeat, and you’re approved!” I couldn’t stop laughing about that one. Sadly, I’m sure it brought a few people in. I certainly will never purchase another brand new vehicle. I’m still driving my 16 year old Chevy 1500 purchased new off the lot…. But like you say, I’ll drive it till it falls apart. Ha nice! My car is only 12 years old, you have me beat!!! I’m a dealer for the people! !